Computer has become one of the indispensable parts of work, study and daily lives, and we store everything such as documents, data, pictures, music, movies, etc. on computer. Files are stored in different disk partitions, say D partition, E partition. However, if a partition is deleted, files and folders in the partition will be invisible in My Computer! How can we recover files and folders from deleted partition? 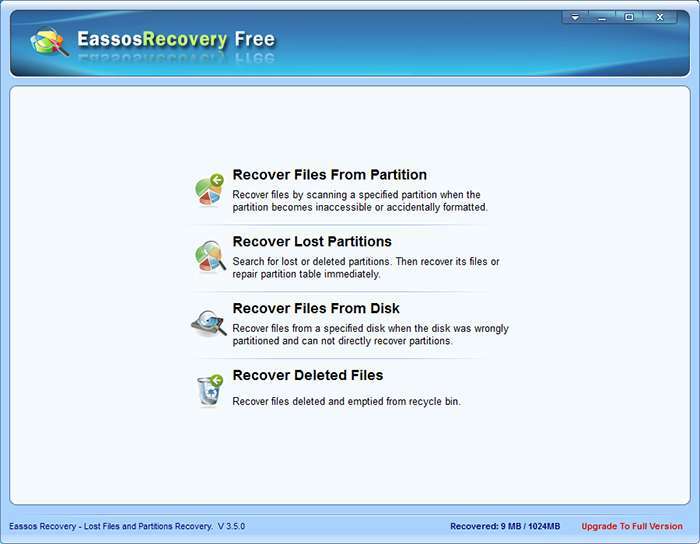 Eassos Recovery Free can help you recover deleted partitions as well as its files and folders. The recovery mode “Recover Lost Partitions” is able to search for lost or deleted partitions and then recover files and partition table all at once. Why deleted partition can be recovered? Hard drive is divided into partitions for data storage, while partition information is saved in partition table which tells operating system where the partition is located, what partition size is and so on. When a partition is deleted, partition information will be removed from partition table and files in the partition are no longer accessible and visible. But files still remain on the disk and they can be recovered by specialized recovery tools before it is overwritten by newly saved files. Apart from recovering files and folders from deleted partitions, Eassos Recovery Free supports the following partition recovery scenarios. This data recovery software supports partition recovery from IDE disk, SATA disk, SCSI disk and Removable disk and supports FAT12, FAT16, FAT32, NTFS file system. Eassos Recovery Free can run under 32/64bit Windows 2000 Pro./XP/Vista/Window 7/Windows8. It’s optimal partition recovery software and free for home users. This entry was posted in Data Recovery and tagged Eassos Recovery Free, free partition recovery software, recover files from deleted partition by EASSOS. Bookmark the permalink.